A new cupcake joint you say? I'm there. And it has a drive-thru as well? Stop, seriously. The idea of a to-go-cupcake is more than I can handle. The funny thing is, that after trying most of the cupcakes, some brioche and a sandwich, that the two latter were my favorite. The brioche comes with homemade jam, made by the owner himself, and is a pretty decent rendition of something you'd find in France. I also enjoyed the turkey avocado sandwich one evening when I needed a quick (and preferably healthy) dinner for myself and my daughter. That drive-thru sure came in handy when time was short. I was delighted to find that a healthy portion of pesto pasta salad came with my sandwich too--something my daughter could easily consume without making too big of a mess (I'll do anything to avoid watching her dump yogurt on her head). Bottom line: definitely bang for the buck. However, some would argue that the most enticing aspect of Divas is the amazing private patio...a respite from the drone of 33rd South traffic. I found numerous sitting areas, mostly full of people sipping coffee and using their laptops as well as a few lanterns hanging from the mature branches of a large tree. The pretty water fountains everywhere create a nice, relaxing ambiance. I also love that Divas offers a seating area, complete with "grown up" books and children's books too. It's like they thought of everything. So the food was good but I am curious as to your opinion on the cupcakes? What were the prices? Your favorite one you tried? I always love a good little cupcake shop! A cupcake drive through sounds heavenly! The sandwich prices are about $8 and they are a good size. The bread I had was delicious too. I've been wondering what the green dome building had been morphed into. Last I checked it was a consignment store! I will have to give it a try thanks for idea. Millcreek is in need of a place just like this! So you got me hooked on So Cupcake, now a new one :) Oh no, never going to loose this last baby weight :) and a drive though, ahh so heavenly. My reason for asking is because I work at a little cupcake shop in Rexburg, Idaho. 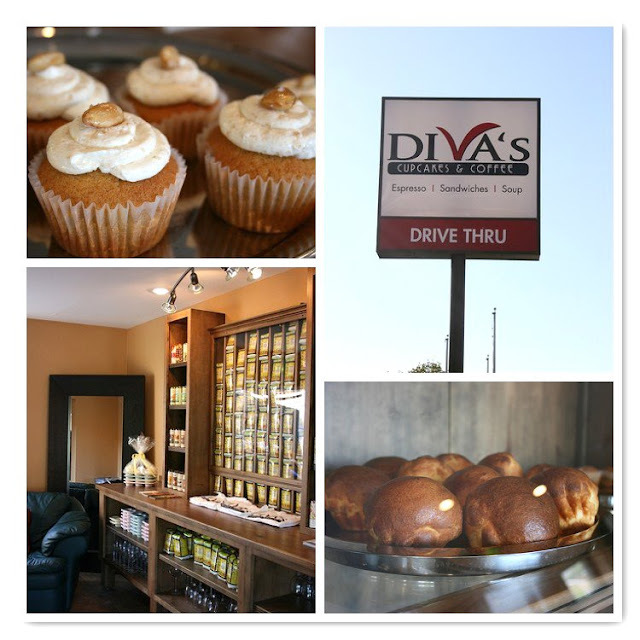 I am convinced that they have the best cupcakes in the area. Thanks for pointing this place out. I will definitely give it a try.